South Korea's unemployment rate rose slightly in August due to a fall in employment in the retail and manufacturing sectors, with poorer-than-expected job creation showing no signs of a letup, government data showed Wednesday. 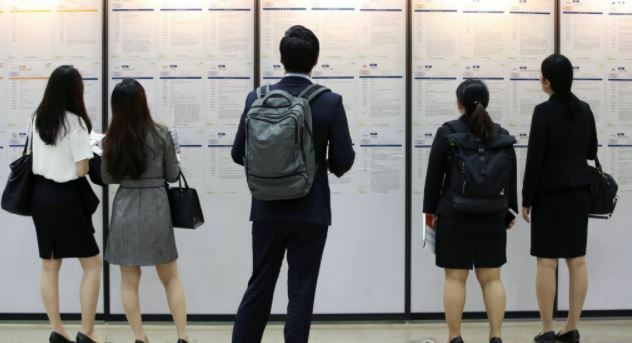 The unemployment rate stood at 4 percent last month, up 0.4 percentage point from a year earlier, according to the report compiled by Statistics Korea. The number of employed people reached 26.9 million in August, up 3,000 from the same month in 2017, according to the data. The increase in jobs last month is the smallest since January 2010, when 10,000 jobs were cut. The unemployment rate for young adults -- those aged between 15 and 29 -- was 10 percent, up 0.6 percentage point from the previous year. The employment rate stood at 66.5 percent in August, down 0.3 percentage point from a year earlier, with the corresponding figure for young people at 42.9 percent, up 0.2 percentage point over the cited period. The number of newly added jobs has stayed below 10,000 per month for the second straight month. The manufacturing sector shed 105,000 jobs, marking a decline for the fifth consecutive month. The retail segment also saw a reduction of 123,000 jobs in August compared with a year earlier. "The automaking and the shipbuilding sectors are still struggling, and their slump is affecting other related sectors, such as retail," an official at the agency said. The number of unemployed reached 1.13 million in August, hovering over the 1-million mark for eight straight months. In June, the government cut its job creation target to 180,000 this year from 320,000. Since May, the government has been implementing a 3.9 trillion-won ($3.69 billion) extra budget largely to create jobs. Seoul's push comes as President Moon Jae-in has called for all-out efforts to create quality jobs.